I love books. I love the feel of books...the covers, the words, pages. There is something so comforting to me to be surrounded by books. I particularly love taking my kids to the library. Mostly because it is a less expensive way of enjoying all the books and letting them each take some home. The kids had no school again today. It is election day, so before we hit the library, I attempted to vote. After loading up all the kids, which seemed particularly difficult, I wearily drove to the voting precinct. Unloaded the kids, yelled at them to not run in the parking lot, shoved and stuffed the baby (he's 2, not really a baby I guess) into the umbrella stroller, I realized I didn't have my driver's license. Ugh. Loaded everyone back in the van to go home and get the license and repeat the unloading process, in order to make my voice heard. "I think election day being a day off is anti-women and created by men! It disenfranchises all us SAHMs! Pissed." Eventually, my vote was cast. Good, democratic behavior was modeled. And we were on our way to the library. Our library is big and busy, which is awesome. And of course there is more than books at the library for the kids to enjoy...fish, puppets and the like. The other night I re-watched a documentary film a friend of mine made called "Shelf Life." 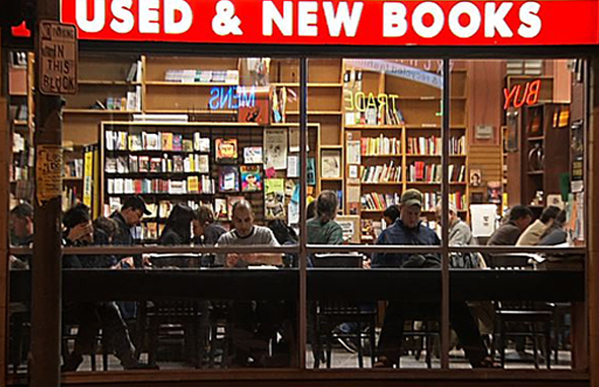 The movie really captures what it is to love books, reading and book stores. It reminded me of that good feeling real books can give you. Click here to get more information about the movie "Shelf Life." One of my favorite moments connecting with my dad, ever, was when he talked about the books he loved. He spoke for hours about the books he enjoyed throughout his life and with each book was a story. A story about why he loved the book and what was happening in his life at that time. It was a fascinating glimpse into his world. That Christmas after we talked he printed out the book list and gave me one and my siblings each a book off the list. Best gift, ever. The bookstore featured in the documentary is really like a community center. It is a place for people to connect. It reminded me of my husband's bookstore affair he had years ago. He used to work with very troubled kids in a poor neighborhood on the border of Detroit. Sometimes he needed to decompress before coming home. He loved those kids, but often felt powerless and hopeless. Instead of going to a bar, my husband went to the local bookstore in our quaint little downtown. (Which is a just one more reason I love him.) 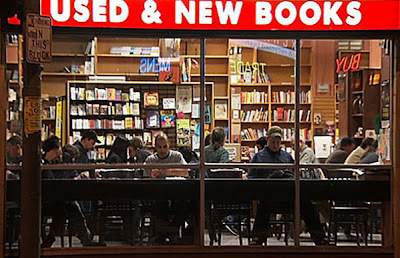 Picture the bookstore in "You've Got Mail" and that is just about exactly like this one. There he would pick out books for our own precious little ones (only two kiddos at that time) at home. It was owned by a woman whose whole aura was book-y. You had a question about any book, any where and she would have your answer. My husband, Tim, loved it when she turned her nose up at The Berenstein Bears books because she felt the Papa Bear character was always the "dumb bear scapegoat." That bookstore, "Half-way Down the Stairs" closed, like so many small locally owned bookstores these days. But watching the movie Shelf Life reminded me of all this wonderful book love. I may not have a bookstore like Powell's (the bookstore in the movie) and our own little gem of a store may have closed, but I have the library and I can tell my own kids my book stories. And for that I am so grateful. Speaking of grateful, in honor of not forgetting Thanksgiving, we did another turkey day craft today. Thankful leaves. We do this very easy craft every year. Simply cut out leaves and each night the kids write down what they are thankful for, then we tape them on the wall. To learn more about the movie Shelf Life (or to buy a copy) of the movie go to shelflifedocumentary.com.